Active antennas can provide very good receive performance from a physically small structure. However there are some design constraints. Good power handling to avoid intermodulation distortion and the production of unwanted spurious signals. If these factors can be overcome. The design should work as well as (or in some cases better than) a full sized antenna. However this is a tall order, as strong signal handling is the main issue with low noise amplifiers, especially when used in a broadband configuration in the presence of strong local signals (usually broadcast stations). Note that with all types of active monopole antennas the performance is very much determined by the height of the antenna above ground and the amount of unwanted noise that is coupled into the connecting cable which forms part of the antenna. These webpages explain why this is so, and how to improve the performance by careful routing of the coax cable. Here is a selection of some of the better designs that can be found on the web. The following is a very simple design for an Active monopole antenna. It uses a Mini-Circuits PGA-103+ which is a new type of wideband amplifier built using E-PHEMT technology. Which is specified to operate over the frequency range of 50MHz to 4GHz. Below 400MHz this device provides extremely high dynamic range (IP1 +20dBm & IP3 +36dBm), moderate gain of 20dB with a very low noise figure (0.5dB). The reason Mini-Circuits doesn?t specify an operating frequency below 50MHz. Is that the input impedance of the device becomes progressively higher as frequency decreases. So it no longer has a stable 50 Ohm input impedance, but one that is in the region of 1000 Ohms. This makes it ideal for use in an active antenna. Especially for frequencies below 50MHz. Here is the circuit I have developed. 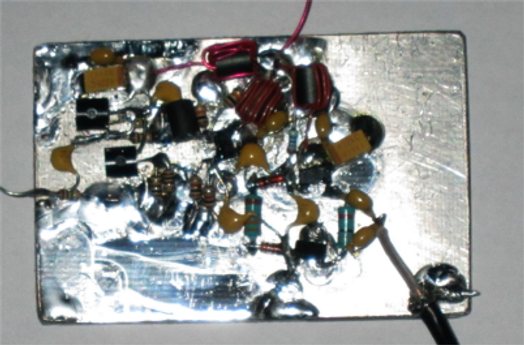 I have included a 10dB resistive attenuator on the output. This is necessary to reduce the overall gain of the circuit, and provide a 50 Ohm resistive termination for the device. Which can otherwise become unstable when connected to an input load that is highly reactive. Such as a short whip antenna. With a 1.2m thin wire or 1m telescopic rod. The overall gain is similar to that of a correctly terminated 10m vertical antenna. As the device can provide a saturated output of more than 100mW. The attenuator also reduces the maximum amount of RF power the circuit can deliver to any receiver that may be connected. 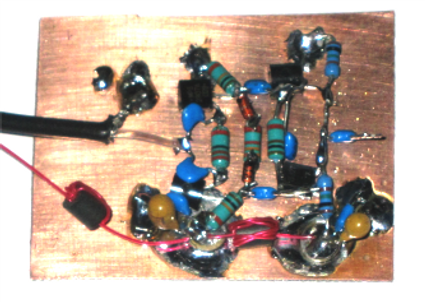 Note that I have incorporated ferrite beads, in order to gradually reduce the gain above 50MHz. It is possible to build the circuit without the ferrite beads. But the antenna may suffer from overloading due to FM, DAB, TV and Mobile Phone transmitters. As the device provides gain up to and beyond 4GHz. 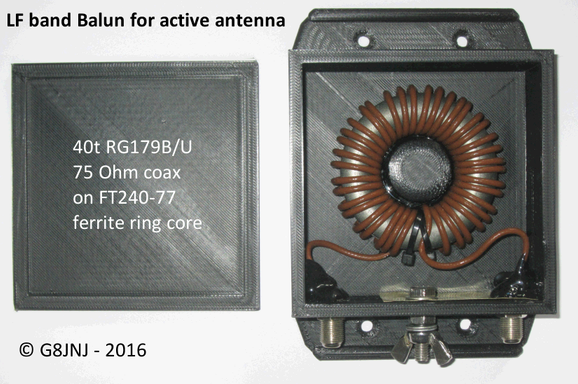 With a suitable antenna and filters it is perfectly possible to build an active antenna with very good performance over the frequency range 1.5MHz to 1.5GHz. However as expected, it suffered quite badly from overload due to the large number of transmitters in the local (urban) area. I'm sure it's possible to get this combination to work much better. But further experimentation is required. One thought is to try applying some negative feedback in order to reduce the overall gain slightly and further increase linearity. Placing two sets of two diodes in series on the input rather than just a pair of back to back diodes. Would also help cope with the higher signal levels from the larger antenna, before starting to enter the conduction region. I chose to feed power to the circuit via the coax. So a hybrid Tee is required to insert the DC supply, and separate out the RF at the receiver end of the coax. I simply used another 10uH inductor and 0.1uF DC blocking capacitor. In a similar arrangement to that shown on the output of the circuit. Of course you can feed DC directly into the circuit if you wish. Just disconnect the 10uH inductor from the RF output and connect it to the DC supply instead. Note that the PGA-103+ and 5V regulator need adequate heatsinking. I soldered both devices directly to the copper clad circuit board. When soldering the PGA-103+ onto the board. I held all three pins with a pair of flat nosed pliers. This helped reduce the possibility of ESD damaging the device, and provided additional heatsinking during (and immediately after) application of the soldering iron. I mounted the device at an angle of about 20 to 30 degrees up from the surface of the board. This makes it much easier to solder to the input and output pins without shorting to the copper groundplane of the PCB. Here are a couple of photos of the circuit built up 'dead bug' style on a scrap of PCB material. In the following amplitude / frequency graph was measured with a VNA 2180. The level into the circuit has been attenuated by 40dB in order to ensure that the amplifier is operating well below saturation. The input to the circuit has also been fed through a 15pF capacitor. This is in order to simulate the impedance presented to the circuit by the whip antenna. However it does reduce the signal level into the circuit. So the actual overall gain is higher than indicated in the graphs. 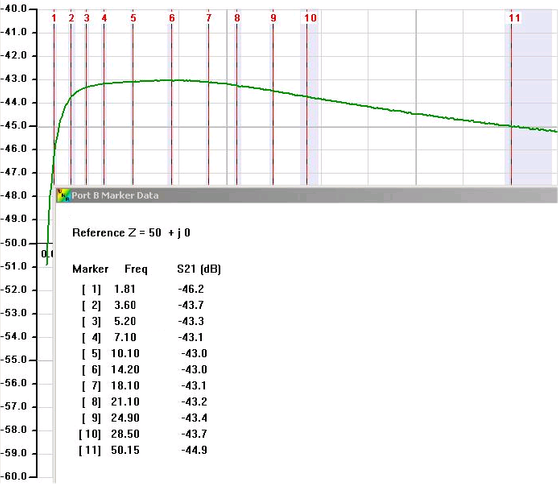 The frequency response of the circuit without ferrite beads is shown in green. The response with ferrite beads is shown in black. Next a graph showing the frequency response below 50MHz in more detail. This plot has been taken with the ferrite beads fitted. The overall frequency response is within +/- 1.5dB over the frequency range 1.8MHz to 50MHz. The next graph shows that the circuit has a very steep roll off below 1.5MHz. This helps to minimise overload from MF broadcast stations. The overall performance of the antenna over the frequency range 1.5MHz to 50MHz is very good. As the moderate gain, good linearity and very low noise figure of the device makes it ideal for this purpose. This is one of the easiest to construct, and best performers of all the active monopole designs I have built so far . 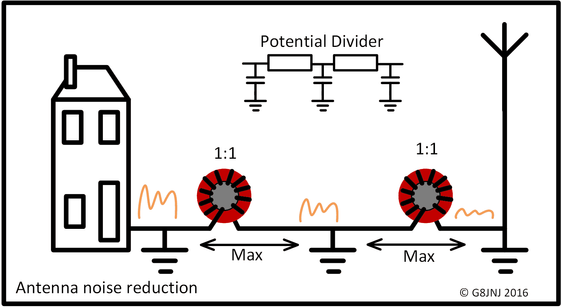 Note that the lower frequency limit is mainly defined by the value of inductors used in the power injection circuit. If you wish to set a much lower frequency limit substitute the 10uH chokes for 100uH (or greater). 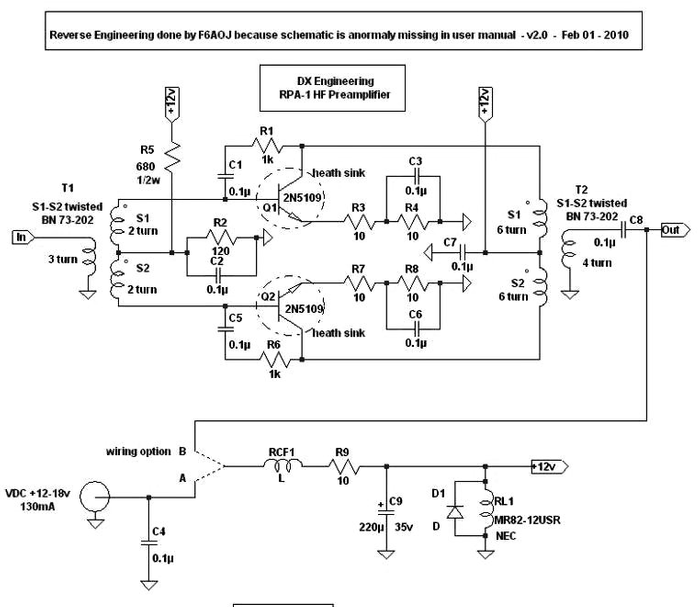 Kent Britain, WA5VJB, suggested that I could further simplify my active antenna circuit, by omitting the complicated DC injection and regulator circuit and replacing it with a resistive load. I took his advice and modified the output attenuator circuit to act as a load resistor and voltage dropper, as shown below. Note that the resistors used in the output attenuator network are required to dissipate some power, so 1/3 watt rated components should be used. In this circuit arrangement the 0.1uF capacitor in the output attenuator network gives a slight increase in gain at frequencies below 100KHz, and the lower frequency limit is now 10KHz. By omitting the ferrite beads and adding an additional HF equalisation network to the output attenuator, the upper frequency limit can also be raised to somewhere around 1GHz. 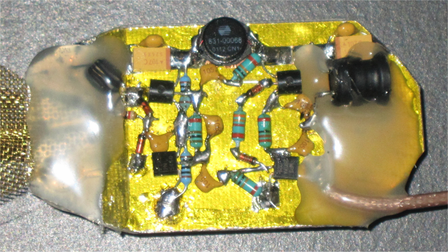 In the original circuit (shown above) I used BAT81 diodes to provide better input protection if the antenna is to be sited near transmitting antennas. These particular diodes have a low value of self capacitance, and do not affect the frequency response too dramatically. 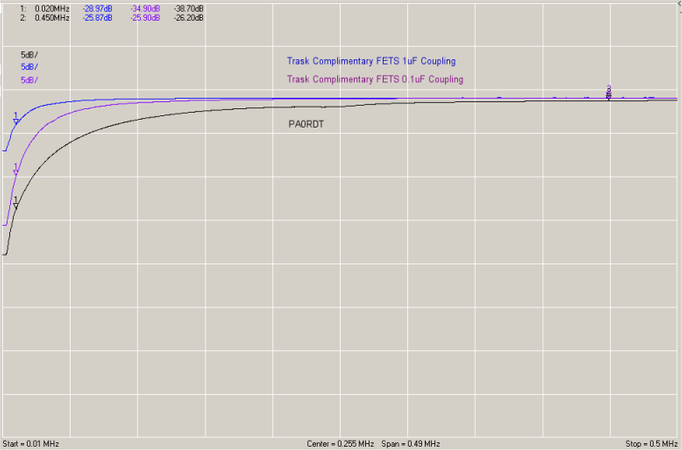 However when used in this configuration they can seriously degrade the intermodulation performance. An alternative protection input scheme using series connected, reverse biased diodes is shown below. Here's a screen grab from HDSDR showing the DC to 100KHz spectrum using the active antenna and a RTL 820T2 dongle in direct sampling mode. Note that the height of the antenna above ground makes a difference to the output signal level, but once you get outside the local noise field it does not make much further difference to the S/N ratio. The coax forms part of the antenna system, so it has to be routed away from noise sources. 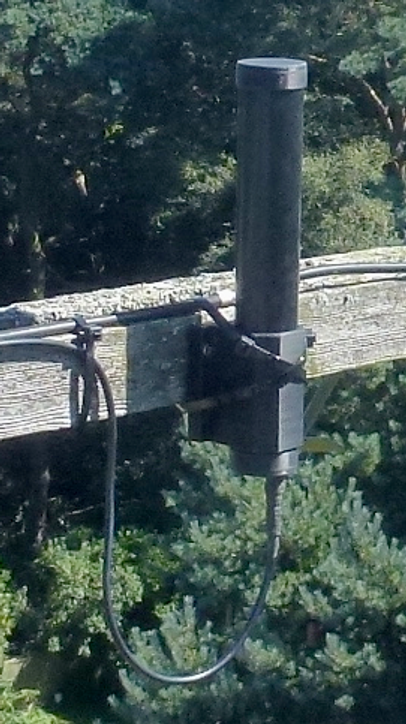 As the antenna is a high impedance device the feed coax needs a good ferrite choke Balun wound on something like type 77 Mix for the LF bands, and (this bit is crucial) a good separate earth bond, not associated with the house mains supply, on the antenna side of the choke which should be mounted at ground level. 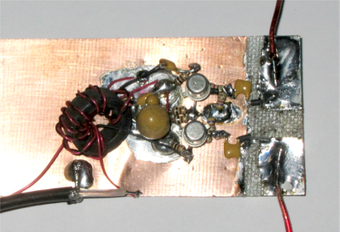 Here's a picture of a choke Balun that I built for use with the SUWS WEB SDR. The case has been 3D printed and has fixing tabs for tie wraps and holes for screw mounting. It also has a small hole near the connectors to help prevent a build up of condensation inside the case. The number of turns has been optimised in order to help reduce noise pickup in the 300-500KHz NDB band. The SDR has a 75 Ohm input and the satellite TV coax is also 75 Ohm, which is why the Balun is also wound with 75 Ohm coax. The common mode impedance presented by the choke on it's own is not sufficient to suppress all the noise induced onto the outer of the coax, so the addition of an earth bond (and also running the coax along the ground) is necessary in order to provide a preferred lower impedance route to ground rather than through the choke. 75 Ohm foil screened and foam insulated Satellite TV coax is the cheapest option for long cable runs. My preferred solution is to put the antenna up a tree as far away from the house as possible, run the coax down the tree to the choke and earth spike at the base of the tree and then run the rest of the coax back to the shack either along the ground, or better still buried a few inches below the soil, something like this. 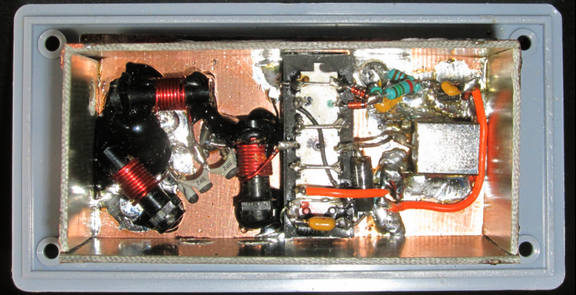 I've also used the same PGA-103+ circuit to build a mast head pre-amplifier for use with the SUWS WEB SDR on 50MHz. But in this case I added a simple Band pass filter to the input and also a by-pass relay, so that I could switch the pre-amp out of circuit if required. The PGA-103+ device can be obtained on ebay or directly from Mini-Circuits in small quantities >20. The device is very sensitive to static and the application of a soldering iron for prolonged periods. So I'd advise getting a few extra ones just in case. Most of the parts are easy to obtain, perhaps with the exception of the main RF device in some parts of the world. Alternatively you could buy a kit and modify it. Order details about 1/2 way down this page http://www.g4ddk.com/ cost is £12 for all the bits apart from a 5v regulator. eBay also have some different versions of kits from time to time. This is a very simple compact antenna. I have built two so far. One is now working in the garden about 5m away from the house, but needs elevating higher off the ground than the current 1.5m. It picks up a lot of noise when close to the house. Like all E probe antenas it is very prone to common mode noise. This is very difficult to choke off the feed line due to the high input impedance of the design. I may need to experiment and build a balanced version to see if I can reduce noise pickup. 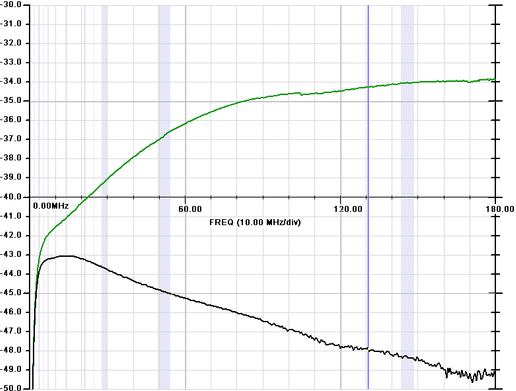 The frequency response of the version without the 10uH series choke connected between the antenna and the amplifier is very flat +/-0.5dB from 50KHz to 30MHz. Adding the choke lifts the response at 30MHz by approx. 10dB. The upper frequency limit seems to be constrained by the input capacitance of the amplifier. Modifying the shape of the antenna element to increase its self-capacitance improves the HF performance without degrading performance at the LF end of the operating range but more testing needs to be done. Note that it's not a good idea to add back to back protection diodes across the amplifier input of these high impedance designs (as shown in the picture below). If you do want to add diodes connect them in series so that they are reverse biased between ground and +ve supply rail with the junction connected to the amplifier input. Owen Duffy has performed a detailed analysis of this antenna. Including the influence on it's performance by the length of feed cable and other factors associated with its installation. There are also a number of kit verisons available if you want to make something that looks a bit more professional. 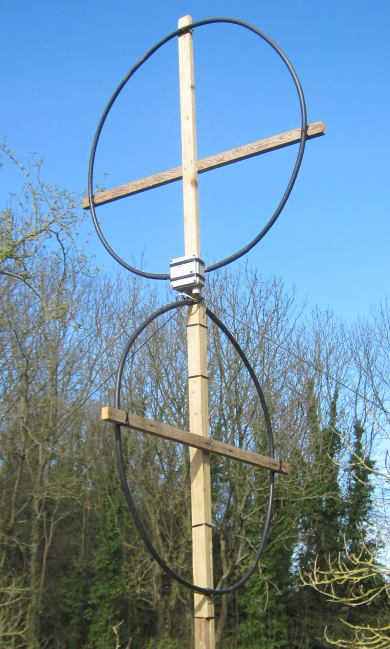 Since originally building this antenna, I have found another updated version designed by PA0NHC, who suggests that his design may offer better performance. Prototype built on copper board on top of insulating layer of self-adhesive Kapton tape. 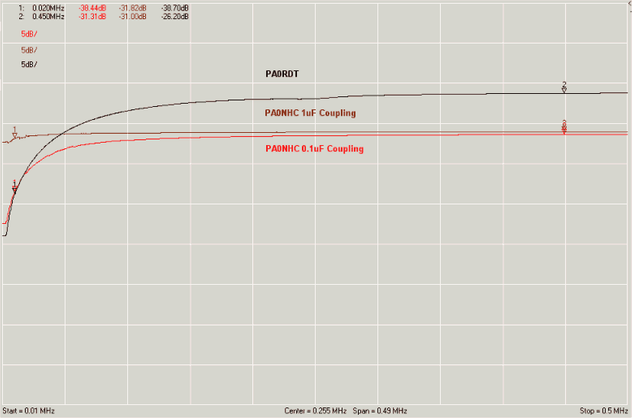 However the gain of the PA0NHC antenna seems to be about 4dB less than the PA0RDT design, which would further contribute to an improvement in the intermodulation performance. 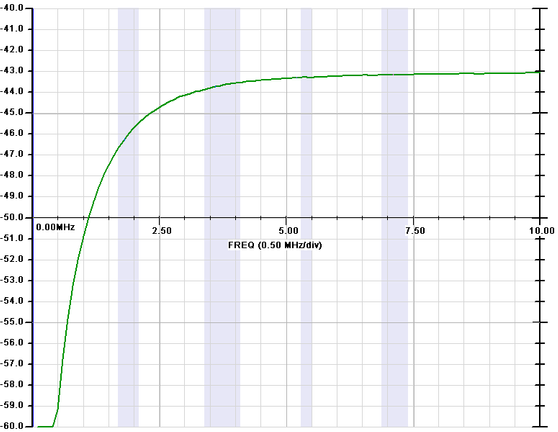 The graph below shows the measured gain frequency relationship of the two types of antenna. In the case of the PA0NHC antenna I also experimented with changing the value of the 0.1uFcoupling capacitors to 10uF in order to decrease the lowest operating frequency. This would also produce a similar result with the PA0RDT design if you are interested in the reception of frequencies below 50KHz with these antennas. Note that in order to achieve the reception of such low frequencies, the DC injection / RF blocking choke in the antenna circuit and Bias Tee also need to be increased in value from 470uH to 10mH. Ensure that any chokes used for this purpose have a low value of resistance and a high enough current rating. I used a FASTRON part number 77A-103M-00 10mH Inductance, 14.4 Ohms DC resistance and 300mA current rating, which is stocked by CPC. The plots shown below were taken with 10mH choke inductors. In practice 1uF coupling capacitors seem to provide the best compromise between acceptable low frequency performance and the rejection of excessive levels of 50Hz mains hum. Pieter, PA3FWM has produced another updated Mini-Whip design based on PA0RDT's original. As you can see above I've added some extra components to Pieter's design. This is to add some input protection and also to allow adjustment of the bias current for best IMD performance. I measured it to have OIP2 = +80dBm & OIP3 = +33dBm so it provides a slightly better IMD performance than the original PA0RDT design. This means that it is good enough to use with a 1m whip antenna in place of the plate or small wire loops that have been used by Pieter. Here is the circuit I'm currently using. This is another varitaion on the PA0RDT design but is sold as a complete unit on E-Bay. I haven't had a chance to build or test this design so far, so I can't comment on its performance in comparison to other similar offerings. Unfortunately the published specification does not mention the IMD performance. However I have previously built other E-Probe antennas using dual gate FET’s instead of JFET’s and I found that the IMD performance was not as good. 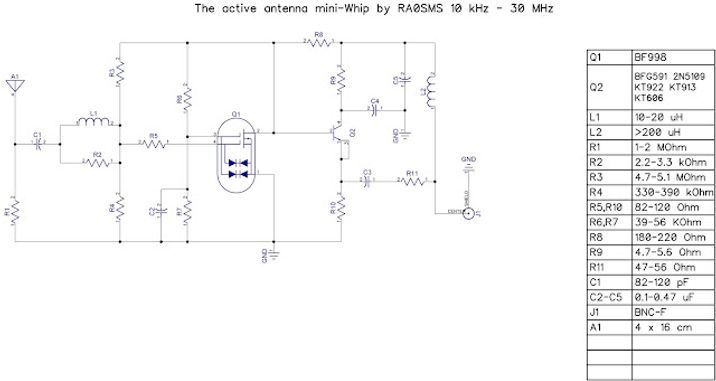 has produced a number of excellent active antenna amplifier designs. Some of which have been recently updated as a result of feedback from constructors such as myself. I have built the circuit shown in Figure 5 in the first document. This works very well and doesn't require any special transformers. Using the component values shown in the circuit above, it has a flat frequency response from less than 5KHz up to and beyond 30MHz. The measured IMD performance was OIP2 = +59.1dBm and OIP3 to be = +43.8dBm which is about 12dB better than PA0RDT. So it is possible to use a slightly larger whip antenna, which will provide improved S/N performance without introducing a significantly higher level of intermodulation products. 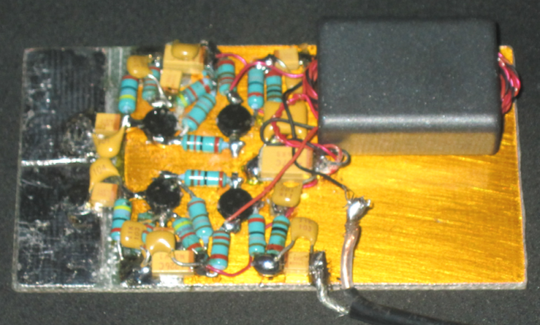 Here is another version using a larger DC bias Tee choke and 1uF coupling capacitors, which has been optimised for the VLF bands. 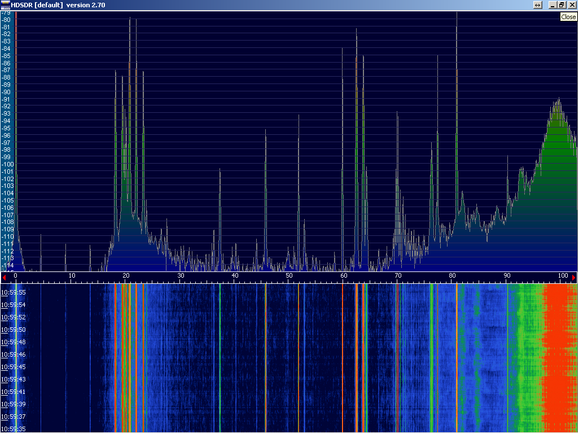 I'm currently using this design for LF band reception on the SUWS Farnham WEB SDR. This picture shows the antenna as installed at the SDR site. The external housing is made from 50mm diameter plastic water pipe with 3D printed end caps and mounting clamp. 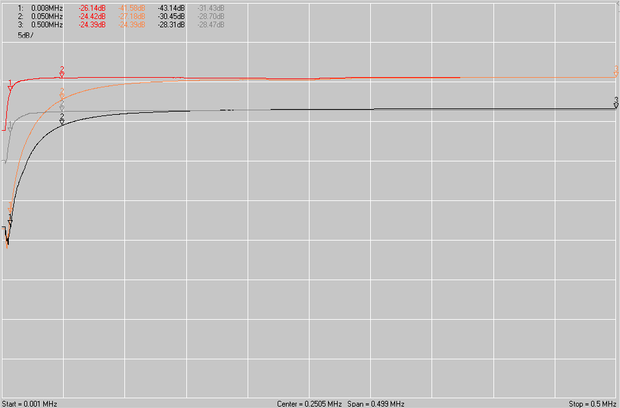 Frequency / gain plot of Trask antenna vs. PA0RDT. Both antennas using 10mH Bias and DC injection chokes. This is one of my favorites so far in terms of ease of construction vs. performance. Similar to one of Chris Trask's designs but with a few additional modifications. I modified this by using a FET Constant current source in place of the Input FET source resistor, and set the current at about 20mA. I also omitted the choke in the emitter of the buffer stage, as this seems to be an unnecessary complication. Chris Trask has also added this modification to one of his designs. 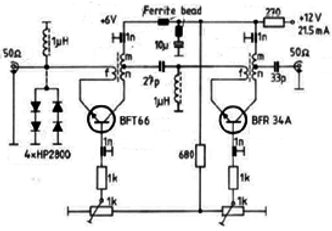 The ferrite beads shown in the circuit diagram. Are optimised for the frequency range in use, and are used to define the upper operating frequency. I omitted them. As standard single hole beads will not perform the same function. They need about three turns of wire on them to give a similar characteristic. This circuit seems to work very well, and has an extremely flat frequency response from about 10KHz upto >180MHz. IMD performance seems reasonably good, but I still need to measure this properly. W0QE has a lot of interesting information on his website, including an amplifier that is suited for use as an active monopole. A predecessor of the PA0RDT, Clifton Labs and Chris Trask designs. Chris Moulding of Cross Country Wireless pointed out these designs to me. Most are easy to build. But the the last link may be a bit more problematic as it's a superconducting loop ! Note this link is still broken - can anyone provide a new one ? I have one of these working on top of my works QTH (and another sitting around in my garage) that I use for making remote TX antenna field strength measurements. Although it's supposed to be a balanced antenna, it is not immune from common mode noise. However it gives very repeatable results, in terms of long term amplitude stability. Chris Trask has analysed this design and produced his own circuit. I've been building a broadband version of Chris Trask's remote tuned design. Which I hoped would outperform the Datong. However at the moment I'm having a few problems getting the circuit to function correctly. The individual stages work OK. But when they are connected together the frequency response is not particularly flat. A suggestion is that the cumulative phase / time delays through the cascaded stages. May be messing up the feedback circuitry. I've spent several days on this so far. So I've put it aside for a while and will revisit it later. This is a relatively new design of balanced active antenna. Which is being produced by Chris Moulding of Cross Country Wireless. I have an early production version, which works well. Performance is comparable to the Datong AD 270/370 (which is no longer available). One interesting feature is that the RF 'head' and receiver interface are connected together via CAT5 multi-core Ethernet cable, rather than coax. Chris claims that this helps to reduce the incidence of common mode noise pickup on the interconnecting cable. I was not able to fully verify this. But the design did seem less succceptible to this problem than the Datong models. I had previously built a version of the ARA-500 (50-500MHz) which used a fat printed circuit board bi-conical style dipole. This used a broadband balun on the input of a BFT66 bipolar transistor RF amplifier with ferrite transformer derived negative feedback. The circuit was similar to a broadband pre-amplifier design originally published in the German 'VHF Communications' magazine 1978 Q1 Pages 30 ? 36. Entitled ?A New Type of Pre-amplifier for 145 MHz and 435 MHz Receivers? By M Martin, DJ7VY. The MuTeK BBBA 500u also used a similar circuit, but only using one stage of amplification. This provides a gain of about 10dB. The later versions of Dressler such as the ARA-2000. Use FETs or broadband amplifier MIMIC's of various types and a strange helically wound antenna element constructed from foil tape. I'm now trying to get hold of a small quantity of RF3827DS RF amplifier chips to experiment with and maybe try building something like a better version of the Dressler Active antenna. This is proving to be somewhat difficult. So if anyone can help please drop me a line. SSB Electronics LNA-3000 Broadband masthead pre-amplifier (now discontinued). Although not strictly an active antenna, this low noise broadband amplifier proved to be a useful addition to a Discone or Bicone antenna and often dramatically improved reception on the VHF and UHF bands. Faulty units often appear on the surplus market, but it is not immediately obvious which semiconductor devices were used in the original design. However I have successfully repaired units by replacing the two stacked semiconductors with MGF1302 Low Noise GaAs Fet's. When working correctly the source load resistor in the circuit has a value of 33R (3 x 100R in parallel) which provides a voltage drop of 4.16v with a bias current of approx 126mA for the two devices (63mA per device). The amplifier typically provides a gain of approx 12dB, with a low noise figure and good strong handling performance. 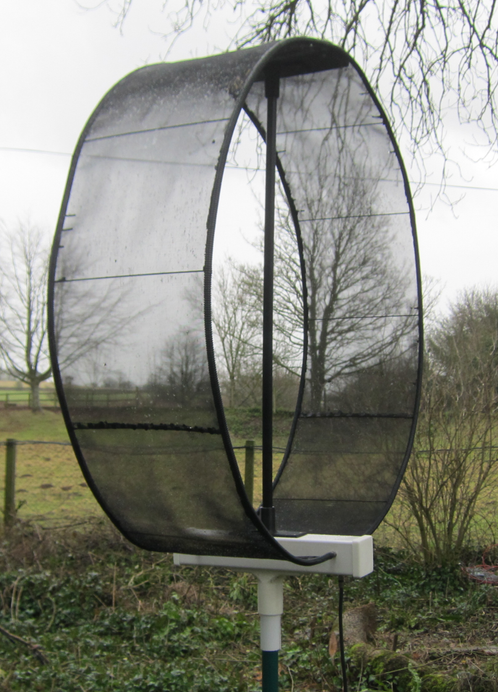 The Wellbrook loop is a very popular commercial loop antenna that works very well. However if it becomes faulty Wellbrook and only supply a limited number of spares. The amplifier module is potted in resin and so is very difficult to repair. 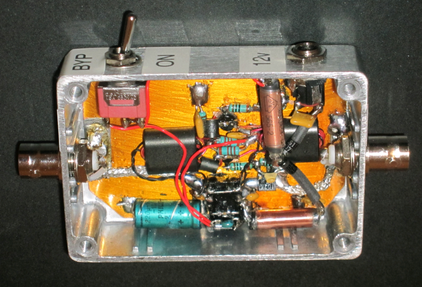 contains a detailed tear down of the Wellbrook loop amplifier including a circuit diagram. It's well worth a look if you are considering buying a Wellbrook loop, or have one that has become faulty. I've also thought about putting the amp in a die-cast box and attaching the ends of the coax loop with something like 'F' or TNC connectors. That way different size loops could be swapped as required or the loop could be easily broken down for portable / storage purposes. Very easy to build. Reasonable noise rejection. 10dB variation in frequency response between 1.8MHz & 30MHz with peak at 10MHz. Performance is reasonable but IP3 is quite poor. So only a small loop can really be used with it. I have now acquired the special op-amps that are required for this design. But they seem to be very sensitive to mishandling. Especilly if soldered by hand. I've already blown up six of them, so I wouldn't reccomend this one as Ithink there are better alternatives. This is an excellent commercial product, model number AAA-1C. A very interesting design which can be remotely switched to operate as either an active loop or dipole. Here's my crossed loop array using the LZ1AQ kit. The loops are 1m in diameter and made from LDF4-50 semi rigid coax. It's easy enough to build, here's my first version built on a bare PCB covered in Kapton tape, which I photographed whilst experimenting with different ratio output transformers. And this is the current version I'm using. I omitted the Input filter, 10v regulator and used a large ferrite output transfomer (to avoid DC saturation) with a coax feed and external bias Tee rather than using CAT5 cable. The transistors are matched pairs of MRF581's which give a very flat frequency response, but 2N2222A's can be used for the input stage. To get the best from this design you need to use a loop with as low a value of inductance as possible. This is what I'm currently using. It's 1m in diameter and is 0.3m wide. It has an inductance of approxiamtely 1.6uH. There is a wealth of useful design information on both of LZ1AQ's websites that are relevant for anyone contemplating the construction of an active loop antenna. The DL4ZAO website also contains some useful circuits that are very similar to those of LA1AQ. Note that the documents PDF copies written in German, so Google translate will not work. However it is still possible to understand the diagrams etc. 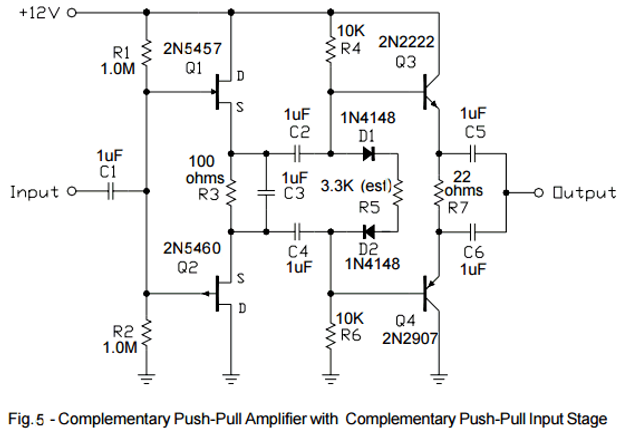 This design uses two Mini-Circuits GALI-74+ devices in a push pull circuit with a balanced output transformer. and the circuit diagram can be found here. I haven't (so far) been able to find any specifications relating to the intermodulation performance of this design. Individual GALI-74+ devices have published values of +19.2 dBm typ. output power at 0.1 GHz and an IP3, +38 dBm at 0.1 GHz, so the LZ1AQ and Wellbrook designs are likely to be better in this respect. Note that the higher value of amplifier input impedance may result in this design being a better performer on the HF bands especially at frequencies >10MHz. I like this as it uses a varicap tuned ferrite rod. Which has an electrostaic screen wrapped around it. 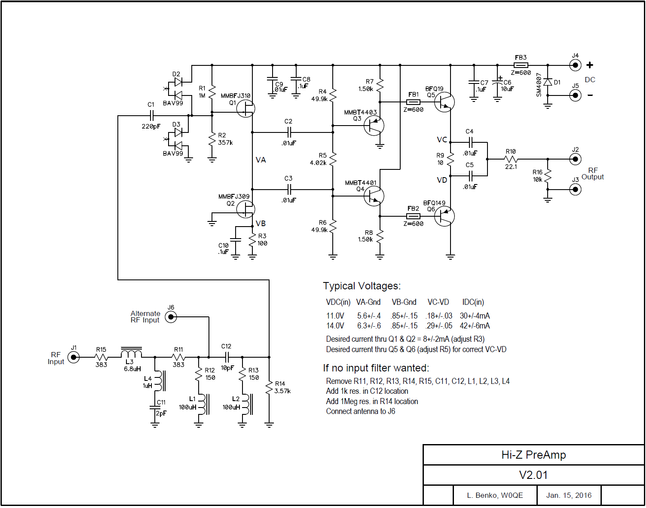 No circuit is included in the manual, but it's possible to figure it out from the PCB layout and Parts list. Two of the best designs I've found are shown below. Norton Amplifiers use a transformer to provide lossless negative feedback which linearises the amplifier and improves the intermodulation performance. 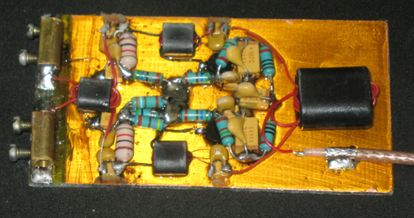 Another type of design using conventional feedback techniques is based on the DX Engineering RPA-1 Pre-amplifier which is very popular for use with low gain antennas such as Pennants, flags, and K9AY loops. My thanks to Jeff for allowing me to include this circuit diagram. I built my copy using some MRF581 transistors which I had to hand. The only modifications to the circuit being the addition of single hole ferrite beads to the transistor base connections and a reduction of C3 & C6 from 100nF to 1nF, which I found produced a flatter frequency response which was usable from 50KHz to 50MHz. I also added some bias tee chokes so that I could remotely power the amplifier via the coax if required. The intermodulation performance seemed to be slightly better than the previous Norton amplifier, and I found that it was a lot easier to construct. This is my current preferred design for use as a distribution amplifier.